Wow, at almost 800 pages, it took me so loooong to finish this book. Christopher takes his saga VERY seriously. Did I mention seriously? Let me say it again, VERY seriously. A little too serious for my own particular taste, but I'm of the type that found the pronunciation guide on the back pages unhelpful in that, I don't plan on actually speaking the Elvish language outside of the book. And the Acknowledgments...we'll, let's just say the kid has self-esteem to spare. He likes this story, as well he should. 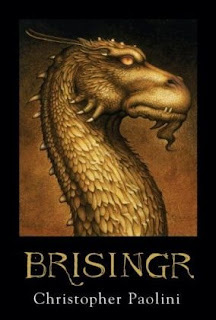 With that being said, Brisingr was...okay. As is typical with a series of books, the first one is generally best with each successive book becoming less original and more of a stretch. For me, I felt this the case here. There are alot of similarities with past works, Star Wars, Lord of the Rings, etc., but he is hardly the first author to borrow ideas and expand them. He's done a pretty good job of creating his own unique world with, at times, yawn-filled, intricate detail. Brisingr picks up only a few days after Eldest has ended, with the rescue of Eragon's cousin Roran's intended Katrina, from the clutches of the birds-gone-bad, the Ra'zac. In a nutshell, a blooding fight ensues and continues throughout to the end of the book. There's ALOT of men fighting in this one, a hidden pregnancy (woo), more fighting, some one-on-one time with the beautiful elf Arya (ah, but you'll have to read to see what happens, sigh...), some yoda-like moments, a head or two lobbed off, more fighting, and finally, a cleverly named sword. **Also, I'm curious if any other women liked it. Sorry I should've mentioned that. Eragon is the first, and the name of the title character. Eldest was book two. I didn't include too much back story because of length. It's a Lord of the Rings type of tale about a boy and his dragon, Saphira, written by a kid basically. Wow, I just read on Wikipedia that he was 20 when the first book came out. I've seen Eragon around at the library. That's probably why THIS cover seemed so familiar. The first is by far the best, probably because it's a simpler story. In my opinion he's tried too hard with Book's 2 and 3, but with Harry Potter and The Lord of the Rings as exceptions, I often find that the case with a series. I don't have a lot of experience with series, but with Harry Potter, I think they (usually) get much better as they go along. Afraid so. His original third story was even longer, if you can believe that (raised eyebrows), so he decided to make it a "cycle" instead of a trilogy. Has anyone else ever heard of four books being called a cycle, or did he just make that up? I haven't, but then again, I'm unfamiliar with most series, so I'm probably not the one to know.